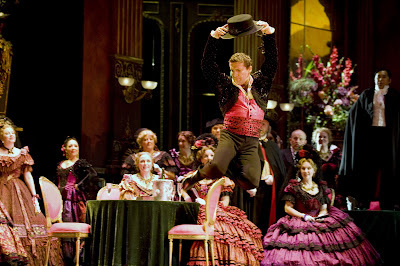 Happy Halloween, Traviata fans! Today is the final day of our caption writing contest for this production, and the final chance for you to win a Traviata poster with our compliments. Yesterday's comments were great - we never knew that Nuccia Focile lying on her deathbed could be so funny! The winning caption goes to Matt Meyers for his comment left on Facebook, "Why oh why did I have that triple shot macchiato after dinner? I'm never going to get to sleep." Without further delay, it's time to unveil the last Traviata snapshot. Now is the time to pull out all the stops and submit all the funny captions you can think of. Only one poster remains...who will win it? !